Sometimes called the "Mohawk River Bridge," this classic white covered bridge served as a movie location in the 60s. 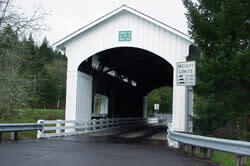 Earnest Covered Bridge is a beautiful picnic location, attracting day trippers and plein air painters. Geocachers enjoy searching for a cache located in the vicinity. Despite its remote location, the bridge is accessible by bicycle. Greater Eugene Area Riders (GEARS) recommends a 45-mile (13.7 m) bicycle ride looping from Alton Baker Park to the bridge. Current Access - Vehicles up to 9 tons, maximum height 12'8"
The slightly longer Adams Bridge was first built here by A.N. Striker in 1903. 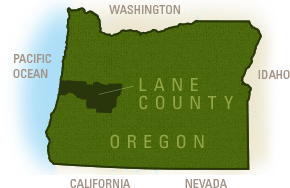 Eventually dilapidated, it was torn down and replaced by Lane County in 1939 for $2,449. It is believed the new bridge was named Earnest after local area residents. 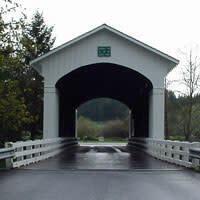 Like many Lane County bridges, Earnest Bridge features a small window on one side for motorists to view oncoming traffic. At one time circus posters lined the interior but those have been removed or disintegrated with time. The Earnest bridge appeared in the 60s movie "Shenandoah" starring James Stewart. The film company altered the bridge to meld with a Civil War era look and, then post filming, restored it with new siding and paint.